For many years Andy Robson & Urban Fox wow fans of blues oriented “ Roots Music” in Germany. They deliver all “ingredients” to their special fan-base. Tight blues rock songs, blues ballads and grooving funk rock. The range goes from heavy to soulful to wah-wah guitar sounds Jimi Hendrix style. 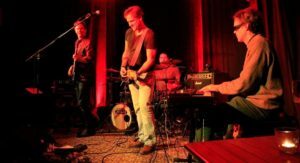 Extraordinary Hammond B3 organ sounds, tight drums and bass grooves and Andy Robsons voice, that unites blues, rock and soul unlike any other voice in Germany. The repertoire is made up of compositions from Andy Robson, chummily musicians and composers as well as rearranged classic cover versions and unknown blues, rock and soul songs. The band is influenced by traditional blues musicians like B.B. King, Freddy King or Buddy Guy, blues rock bands like the Allman Brothers Band, Gov`t Mule or Tedeschi Trucks Band, classic and psychodelic rock bands like Led Zeppelin, The Jimi Hendrix Experience and Z.Z.Top, as well as soul legends like James Brown, Ray Charles and Stevie Wonder.